James Paul Marsden (born September 18, 1973) is an American actor, singer and former Versace model. Marsden began his acting career guest-starring in multiple television shows such as Saved by the Bell, Touched by an Angel and Party of Five. He would then gain prominence with his portrayal of Scott Summers / Cyclops in the first three films of the X-Men film series and star in 2006's Superman Returns which earned him a Saturn Award nomination. 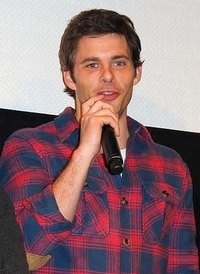 Following his breakthrough in comic book films, Marsden would then star in numerous comedies including 2007's Hairspray which was both a critical and commercial success and won many awards for its ensemble cast. As Corny Collins, he sang two songs for the film's soundtrack which has been certified Platinum by the RIAA. He would continue his success and star in family friendly films such as Enchanted, Cats & Dogs: The Revenge of Kitty Galore and Hop. This webpage uses material from the Wikipedia article "James_Marsden" and is licensed under the GNU Free Documentation License. Reality TV World is not responsible for any errors or omissions the Wikipedia article may contain.